District 6920 Governor Margaret Jacobs makes visits all 64 clubs in the district. She brought a message of accomplishments Rotarians are making worldwide as well as in District 6920. She also presented the club with two banners earned during Greg Sapp's term (2017-18). One was for having a $100 per member average and 100% participation in giving to the Rotary Foundation and the other as a 100% participation in EREY (Every Rotarian Every Year - contributions to the Foundation). Margaret also congratulated the club for having contributed over $100,000 to the Foundation since the club's inception. Every new Rotary member receives a red name badge the day of their induction. The member receives a blue name badge upon completion of a checklist of requirements to move them from a "rookie" status. Among the list: Attendance at a Board of Directors Meeting; Participate in a Club Service Project; Attend a Meeting of Another Rotary Club. The program is designed to help new members become better acquainted with the club and what it means to be a Rotarian. Elizabeth (Libby) Coolidge was presented her blue badge by club president John Herdina on October 25th. Vitoria shared a great deal of information about Brazil and shared photos of her family. She will visit us again to tell about her experiences in the United States and with the GRSP. President John Herdina presented a GRSP throw to Vitoria for those chilly winter nights in Savannah. President for 2017-18, the Hon. Greg Sapp, (left) passes the gavel to incoming president John Herdina. 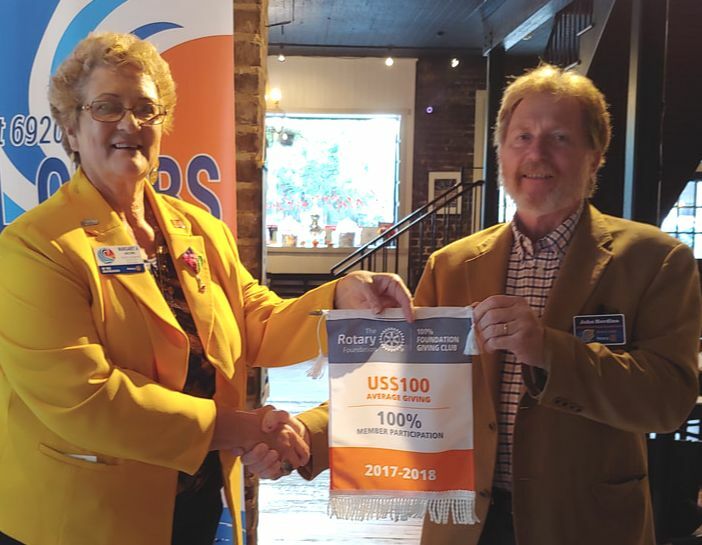 Savannah, GA - (July 1, 2018) - Past District Governor Lynn Hadwin inducted John Herdina as the 21st president of the Rotary Club of Savannah Sunrise. The Rotary year is from July 1-June 30 and, the induction ceremony is conducted at this time in more than 34,000 Rotary clubs around the world. Rotary officers, from the international president to the individual club presidents serve a one year term. John and his wife, Linda (past president of the Savannah South club) have been members of Sunrise for three years. John is a construction specialist with Raymond Engineering. The Sunrise club grew by three in the past few months. Tom Owens, a retired pilot, and Marlon Marchena, a partner in South Coast Contracting Group, were sponsored by Mick McCay and Elizabeth Coolidge, an attorney with Chatham County, was sponsored by Greg Sapp. WELCOME!